Audi A3 / S3 / RS3 Pros and Cons | Page 1 of 3 | Why Not This Car? What drives people to buy (or not buy) a certain car? TrueDelta's members share Audi A3 / S3 / RS3 pros and cons based on their real-world driving experiences. Lve this car, kids love it unless they have to sit in the back. I should have written up the Audi S3 months ago. I haven't because I couldn't figure out what to compare it to. I've had my A3 for 9 years and have put 99000 miles on it. It has been a good car and given me good value. If you are looking for a quality small hatchback, this should be on the list. Poor quality; things break constantly; high repair cost ($6k in 12 months). This is a very fast car. I would only buy this car again with the manual transmission and no bose/nav. Sadly, the TDI is not available with manual. The lines are smooth, elegant, and just down right good looking. 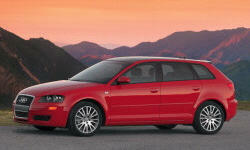 They managed to take a 5 door wagon, shrink it to a size smaller than a 4 door sedan, and make it look stunning. Some people are surprised when I open the hatch. The Audio interface for the iPod was pretty bad, used the CD changer to display 5 playlists off my iPhone. Stylishly classic. Smooth lines add the spoiler. Chassis and suspension is very well balanced; non S-Line version is very capable of soaking small potholes and bumps. With the S-Line (or Sport Package) this car is all but glued to the road. In all-wheel drive trim the car handles very well. In front-track the car still handles well, and is suited for non-snow climates. Holds the road really well; has good pick-up. In general, drives almost like a sports car, but has very practical hatchback design. In Canada, the navigation option is only available in the A3 3.2 as an option which is about $10000 more. The car is build like a tank. Great, sporty styling for a small wagon. Very nice color and wheel choices available. Nice, clean interior. No cluttered interfaces. Comfortable seating and nice colors. Open sky option gives the interior a light, spacious feel. Firm responsive handling in the standard sports package. Quattro allows more extended handling capability before stability control has to kick in. No option to get a manual transmission with quattro and the 6 cyl engine - I was forced to get the DSG "Automatic"
Superb fit & finish. No gaps, no "cheap" plastic parts. Looks like you designed the car around the interior, rather than being an afterthought.